New Advanced Car Painting options have been added to a number of cars – including the 2011 Bugatti Veyron Super Sport — allowing you to more easily paint sub-groups. This includes the ability to paint subsections of wheel rims. Series 3 also includes 41 wheel rims across 22 wheel brands, all of which will be found in the upgrade garage. This gives players the opportunity to further customize their favorite vehicles, as well as the chance to import tunes from previous Forza Horizon or Forza Motorsport games that they previously weren’t able to because a particular wheel type was missing. 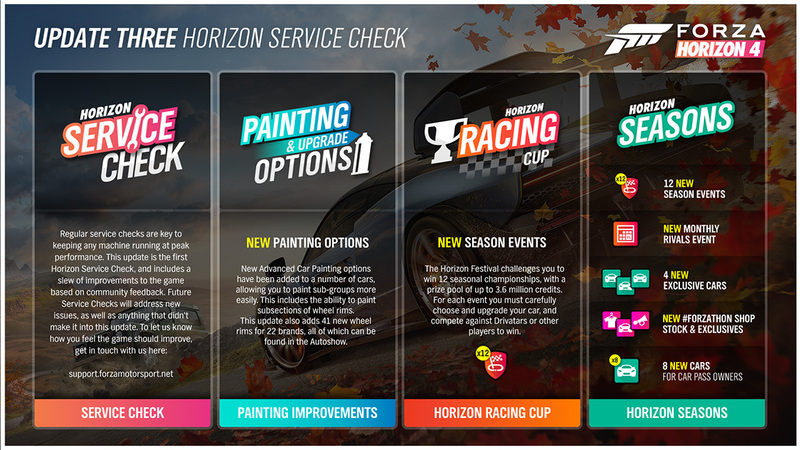 The Horizon Festival challenges you to win 12 seasonal championships with a prize pool worth millions of credits. For each event you must carefully choose and upgrade your car and compete against Drivatars or other players to win. In addition to new features coming along with the update, players can look forward to new seasonal new events, new cars, and new content in the game. Four new exclusive cars are on their way, along with eight brand new cars coming to the game for Car Pass owners. The Series 3 update also includes quality of life optimizations designed to make players’ lives easier in the game. This includes the ability to bulk add DLC cars to the player garage – no need to individual purchase DLC cars to add them to your collection. Players can also now skip the post-race reward sequence, letting them get back to the action that much quicker. In addition, this update includes numerous fixes and improvements to game features like Route Blueprint, Team Adventure, and more.